Episode #27 we speak with a remarkable family who views the world as their home. But what makes this family so unique, is they have spent the last 3 years traveling together on bikes. This is the first in a two part series, where both Miro and I speak with the Vogel Family, also known as Family on Bikes. 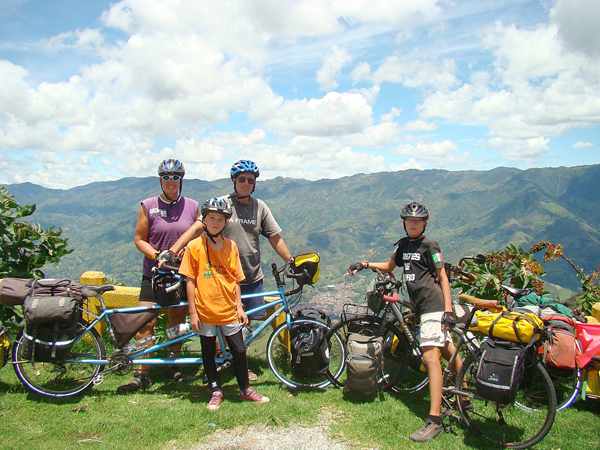 This family just completed a multi year bicycle trek, starting in Alaska, traveling down the pan american highway, finally to reach their destination in Argentina. 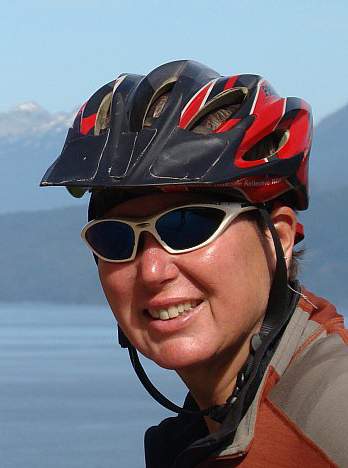 The trip covered 17,300 miles through the Western portion of Canada, the west coast of the United States, then the entire Central America continent, finally biking the length of South America from Colombia to the southern most tip in Argentina. Quite remarkable, especially considering this family of 4 has dedicated the last 3 years of their lives to do so, and upon completion, they found their sons Davy and Daryl, candidates for a Guinness World Record. 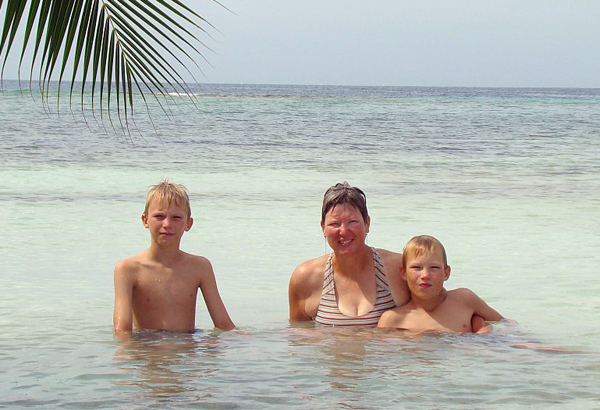 This is not the first time this family has traded a conventional life for a life of travel. 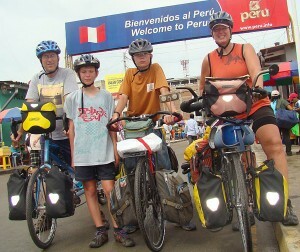 Just a year prior to their Pan American Highway trip, this extraordinary family of 4 took one year to bicycle across the United States & Mexico cycling 9300 miles. 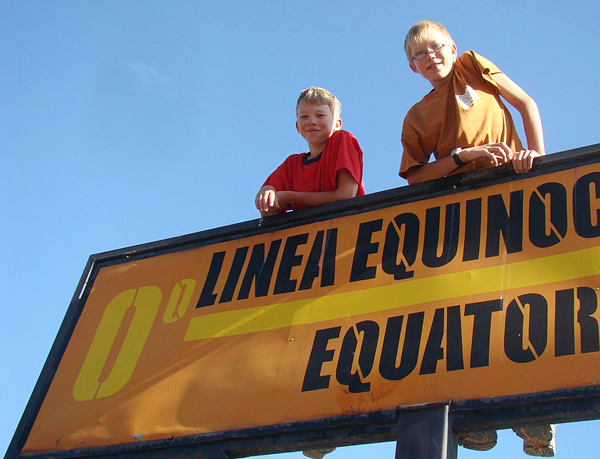 During their first family trip, the Vogel clan visited nineteen US states and five Mexican states and spent twelve months on the road. After a journey of nearly three years from the northern tip of Alaska to the southern tip of Argentina we were ready for our very last day on the road. It started out like any other day. We had camped in a forest of partially rotten trees behind an abandoned logging camp. The trees were covered with craggy strands of greenish moss reminding me of an old man’s whiskers. We rode for a while until the sun came out. It was amazingly beautiful. We were going up a hill with a good view of a lake and the sun sparked off of the lake and illuminated all the trees. We entered a valley with green trees and snow-capped jagged mountains surrounding us. Clouds hung low in the sky, obscuring the tops of the peaks. We kept going and came around a corner and saw a huge sign saying USHUAIA. I pedaled past it first and waited for Mom and Dad. When they came I shouted, “I made it through first! Ha, ha!” I had been on the road for a long time and the whole time I said, “We are going to Ushuaia.” It felt fantastic to finally be there. Be sure to read the whole entry here. John grew up in Rhode Island and never traveled beyond New England until he went to college in Colorado. At some point in his college years he discovered bike touring and spent the next ten or fifteen years biking wherever he went. 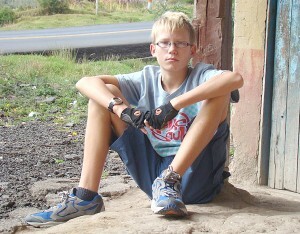 He crossed the USA quite a few times before getting more adventurous and venturing a bit farther from home. One summer he flew to Alaska and cycled back to New Mexico (where he was living at the time). Another summer he cycled Iceland and Norway. Then came Australia. And then India. All that time he was working as a teacher and traveling in the summers. 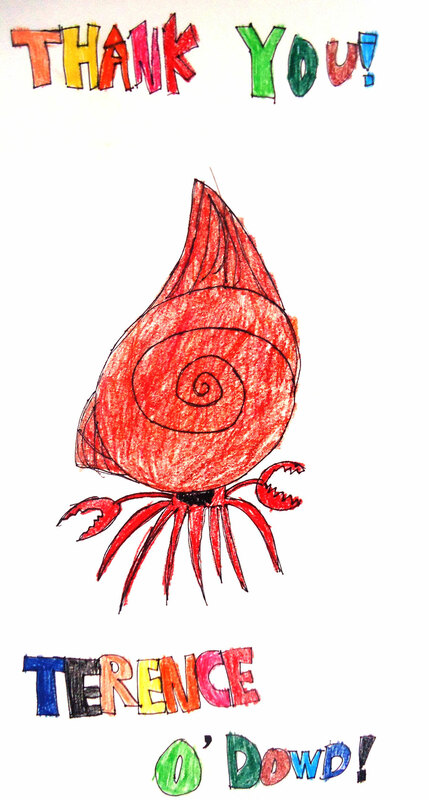 Nancy grew up in Boise, Idaho and had the opportunity to travel each summer to a different place. Although they only traveled for a few weeks, every summer her parents loaded all five kids into the station wagon and took off for parts unknown. When Nancy was 16, her parents took her to Mexico – and her eyes were opened to the fact that there was a big, wide world out there. As soon as she arrived home, she saw a commercial for the Peace Corps and made the decision to join it as soon as she could. True to the decision Nancy made when she was sixteen years old, she joined the Peace Corps upon graduation from university. For the next 2.5 years she helped develop a Special Ed program in Honduras and formed a team for the Special Olympics. Peace Corps gives volunteers a chunk of money when they leave in order to help them get established in the USA. I took the money and spent seven months traveling in South America instead. Upon her return to the USA, she moved to the Navajo Indian Reservation where she taught for the next three years. 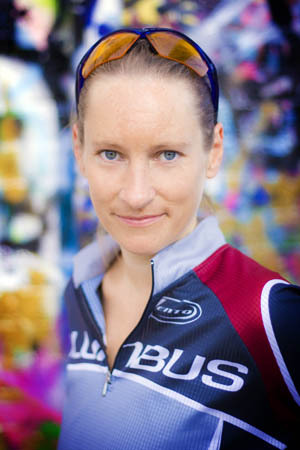 During her first summer back in the USA she took off on my bike and cycled from Norfolk, Virginia to New Orleans. The next summer she visited her brother who was serving as a Peace Corps Volunteer in Malawi. 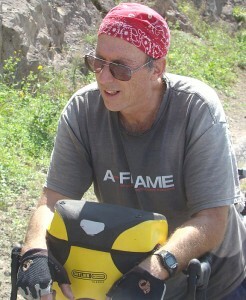 That brings us to spring of 1990 when a series of unusual events brought John and Nancy together to cycle in Pakistan. They spent the school year 1990/91 cycling Pakistan, China, India, Nepal, & Bangladesh. The first weekend of the following school year they got married. They lasted a grand total of two years in Albuquerque before going nuts. They got jobs at an American school in Alexandria, Egypt and took off to explore a new part of the world. From 1993 – 1995 they lived in Alexandria and traveled extensively in the area. They went to Israel and Jordan, Greece and Turkey. They spent a summer cycling the Sinai Peninsula and Israel. After two years in Egypt, they moved to Ethiopia to teach in another international school. From there, they explored Yemen and Mali on bikes and visited many other countries by bus. Their sons were born our third year in Ethiopia, and they continued to travel with kids in tow. The boys celebrated their first birthday in Egypt, their second in Vietnam. They turned three in Thailand and four in Ethiopia. After living in Ethiopia for seven years, John and Nancy got teaching jobs in an American school in Kaohsiung, Taiwan. They explored Taiwan and Bali and Myanmar during the two years we lived there. 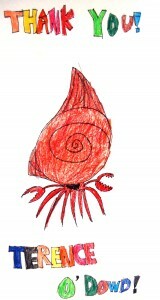 After a brief stint in Malaysia, they returned to the USA shortly after the boys turned seven. They lasted a grand total of fifteen months before we hopped on our bikes and headed out to see our their home turf. 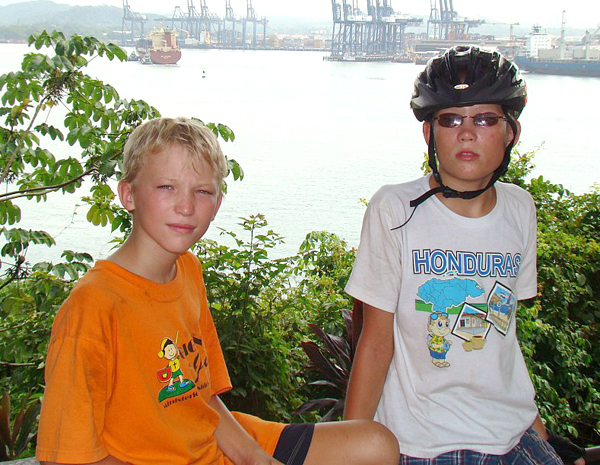 They spent the 2006-07 school year (the boys’ third grade year) cycling 9300 miles through the USA and Mexico. John and the boys were on a bicycle built for three and Nancy rode a single bike alongside them. They visited nineteen US states and five Mexican states in twelve months on the road. They returned to Boise for fourth grade and spent that year planning and preparing to hit the road again – this time to cycle from Alaska to Argentina. In June 2008, they headed out – this time John and Daryl rode a tandem bike while Davy and Nancy were on singles. 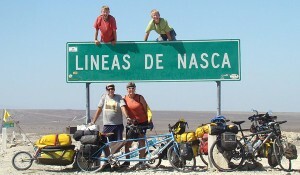 After cycling 17,300 miles in nearly three years, they reached the southernmost tip of South America on March 21, 2011. To read more about this extraordinary family, please be sure to visit their web site here. 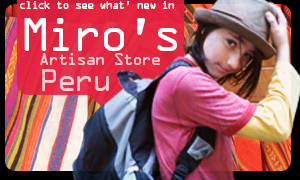 We’ve been in Puru for almost 2 months now. 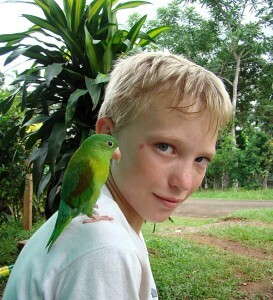 We are sharing a house with some very dear friends that we met on the road in Nicaragua almost 2 years ago. They are another mother and son team , Bubba a former computer programmer turned naturalist, and Aztec dancer, & Dixie, a self proclaimed conscious baby boomer, teacher, holder of two college degrees and perpetual traveler. We actually interviewed them for a past podcast, over a year ago, episode number 12, entitled Transformational Experiences Leading Into 2012 & Beyond . If you haven’t listened to that episode, we would love for you to hear it! We are so happy to share that with you. 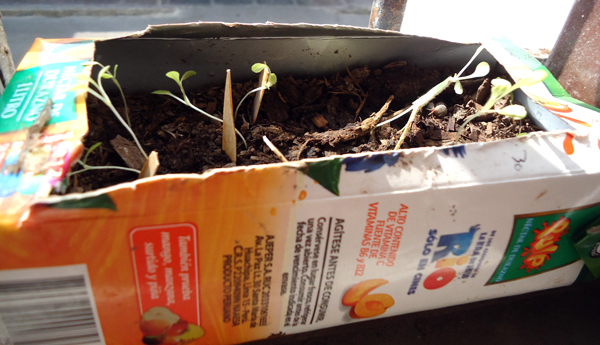 Miro has been keeping a journal of the progress of the lettuce plants. If you’d like to read his post on the lettuce, here’s the link. If you are able to support us financially we would be so grateful. We continue to raise money to keep us safe, and keep us out on the road. I continue to work a little remotely and we have started to earn a little income from our web site, but if you can support us with a donation, no matter the size, we’d be so grateful. Without you, we wouldn’t be able to continue our travels. We live frugally, stay with families & couch surf and volunteer our time and energies. We know this is all part of our experience in the world and are grateful for each and every moment. We want you to know, your donations go such a long way helping keeping us in the present, safe and knowing we have exactly what we need. Thank you to all who have supported us through your donations in the past and those who will in the future and believing in our travels. If you are interested in learning more about ways to support Raising Miro, including donating money or sponsoring our travels please click on this link. If you are interested in finding out about advertising opportunities for our podcasts or website, please on the site, please send a note here or use the donation form in the sidebar. The Raising Miro Podcast has new sponsor! Sign up TODAY! It’s a wonderful deal. We want to take a moment to thank a few peoplewho have contributed to our travels. Your donations have helped cover our travel expenses and for that, we are so grateful! The people who have contributed to Raising Miro are: Ashley Hansen, Grandpa, Scott Van Pelt, Sashya Amee, Ivan Amador,Heather on Her Travels, Bradford Akerman, Tuan Vutran, Terrance O’Dowd, Eric Hammond, Chip Jacobs, Billy Horn and Sonia Kim. Thank you so much! Your support is heart-felt and much appreciated! [iTunes] Subscribe to the Show directly in iTunes. 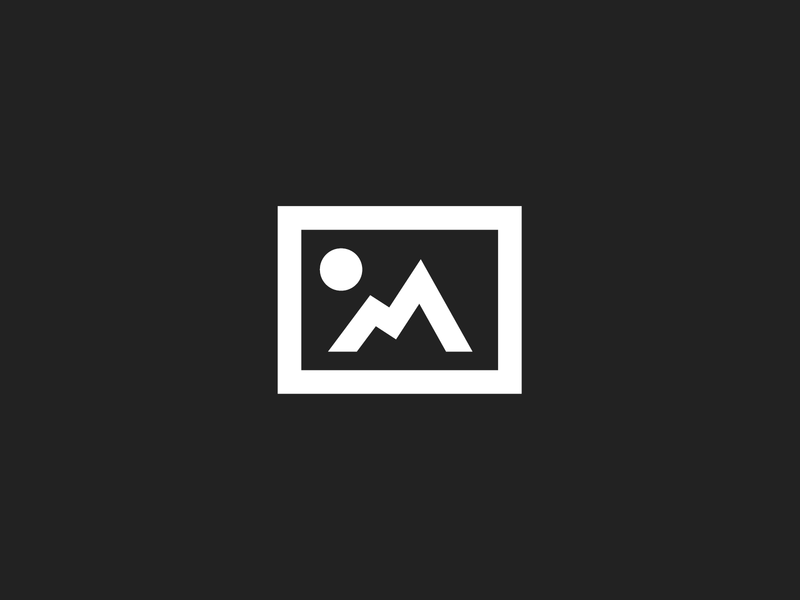 [RSS] Add the Raising Miro Blog feed- Anything a new post is added or a new podcast, have it delivered automatically to your RSS aggregator. [RSS-Podcast] Interested in subscribing to the podcast feed only? That’s what you’ll do if you click on that link. (Like how did Miro get stuck in his chair…) If you have comments or have a question you’d like to have answered in an upcoming podcast, please use send us an email using this contact form. We promise, we answer all of the questions we relieve and we love hearing from you. To those of you who have supported us so far on this journey, the donations we’ve received and the wonderful words of encouragement. Thank you all for your comments and feedback, and please keep them coming. Thank you Hanna for giving us a wonderful professional boost with the intro & outro, engineered by Hanna Jakobson, music “Multilayered Timbres” by Dr. Pimp courtesy of CC (creative commons) license. Family on Bikes – An Uphill Battle? An additional situation had been which the girl got baltimore ravens jerseys denied this the girl appeared to be keen on earning money through the circumstance, inspite of any recorded dialogue in which prosecutors stated seized the woman’s talking over only this having your girlfriend fiancu00e9, your detainee within a great immigration prison with State of az, soon there after your come upon in the new orleans saints jerseys resort. We just met this family in Boise last week! They’re awesome. Our journey seems wimpy (driving from Alaska to Argentina with our five kids) compared to the amazing feat they accomplished – doing it by bike!! !nnThanks for this post. Are you in Peru right now? I have been following Family on Bikes on twitter and facebook for a couple of years, but it is great to learn more about them from this post. I did not realize they were such long time adventures. They have led amazing lives and I love the fact they kept on adventuring when they had kids. So many people hunker down and become normal when they have children. Not this family though. Wow, you guys rock. Our butts are sore after twenty miles! Wow what an incredible family! Congratulations to all the four of you, what a goal you have achieved! I would like to be able to do something like this one day! Before Few Days We just met this family. It was very awesome experience.They have led amazing lives and I love the fact they kept on adventuring when they had kids. They have led amazing lives and I love the fact they kept on adventuring when they had kids. Very thorough and good read. So many of my questions about them answered.